This fascinating creature, the Channel Catfish, has a look that is distinctive to all of nature, and is one of the most popular game fish in North America. Channel Catfish (Ictalurus punctatus) are the most numerous and most fished catfish species in the United States. American Expedition is proud to present information, interesting facts, and photos of the Channel Catfish. A catfish is easily distinguished from other species of fish because of their smooth, scaleless bodies. 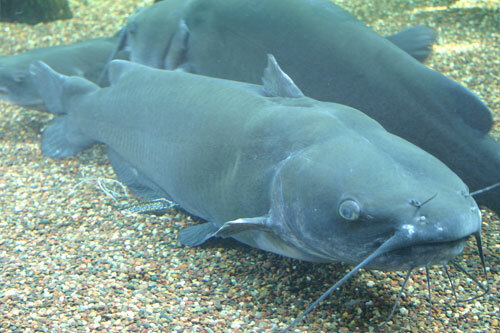 The channel catfish is olive to light blue in color with black speckles on the sides, has a forked tail, whisker-like organs around the mouth, a broad flat head, and a slender body. Males generally are darker in color and have larger heads than the females. Catfish have a very keen sense of smell and taste. The whiskers, known as “barbels,” are around their mouth with the purpose of helping them locate food in the dark waters. In addition, they have taste buds all over the surface of their body. Catfish grow continually; the larger the fish, the older it usually is. On average, channel catfish weigh between 2-7 pounds and measure 12 to 24 inches long. However, many grow much larger than this, with the record weighing 58 pounds and measuring 52 inches. Mating season occurs once a year from May to July when the water reaches around 75 degrees Fahrenheit. Before this season, the male finds a nesting site near shore and uses his fins to make a nest on the ground. He also finds a female catfish. When spawning season arrives, the female will lay up to 50,000 eggs in which the male will then fertilize. This process takes a total of 4-6 hours. After the eggs are fertilized, the male guards them from the female because she will eat them if she is let near. The baby catfish will hatch within a week and then they remain in the nest for another week. These “fries” stay in a school and eat small insects until they are ready to venture out on their own (about 2-3 weeks). Most catfish are mature by the time they are 12 inches long. A catfish’s average lifespan is about 15-20 years. Catfish are monogamous, meaning they have only one mate during spawning season. Channel catfish can be a variety of different colors depending on the environment they are in. Common colors include olive, light blue, and bluish-gray. 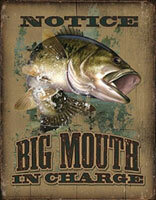 Large freshwater fish, such as flathead catfish and muskies, are the predators to channel catfish. A catfish’s average lifespan is about 15-20 years. Channel catfish are cavity nesters, meaning they lay their eggs in crevices. They have a highly attuned sense of smell and taste. 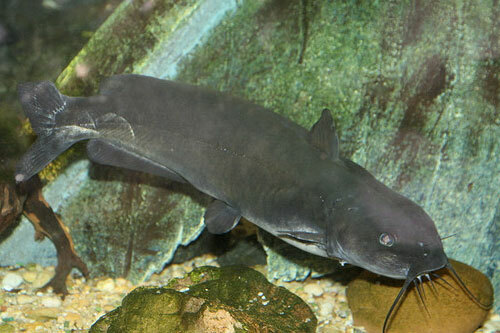 Adult catfish are usually solitary creatures. Adult male catfish are responsible for preparing a nest. Once the nest is built, a female will lay between 3,000 and 50,000 eggs. When the babies hatch, they stay in the nest for a week. Catfish fry will stay in a school for two to three weeks which is guarded by their father. 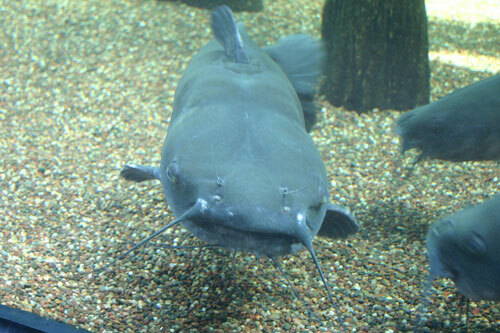 The channel catfish is the official fish of Missouri, Iowa, Nebraska, Kansas, and Tennessee. Catfish never stop growing; the larger the fish the older it usually is. The natural predator list for an adult channel catfish is small. It mainly consists of large flathead catfish and muskies. Channel catfish feed mainly feed from the bottom, but oftentimes they feed from the surface as well. It is a myth that catfish sting. Channel catfish are located in lakes, ponds, rivers, and streams from the Hudson Bay in Canada all the way down to northern Mexico and over to Colorado. They are found near the bottom and prefer mud bottoms to anything else. What Do Channel Catfish Eat? 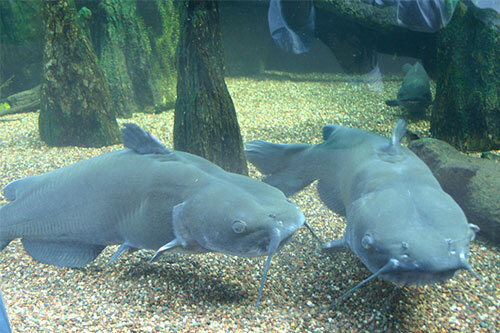 Channel catfish are omnivorous and feed mostly at night on snails, insects, crawfish, algae, and plants. They have an excellent sense of smell to guide them and they are attracted to the foods with the strongest scent. Juvenile catfish eat small invertebrates and insect larvae. Their diet changes as they grow older. Catfish feed from sundown until midnight. Fish on the bottom for the most luck. Find the correct fishing reel that you feel most comfortable using. The spin cast reel is the easiest to use for a beginner. A catfish rod is a sturdier rod to use if you plan on pulling in big fish. Juglines, trotlines, and limblines are all popular ways for fisherman to catch catfish without a rod. 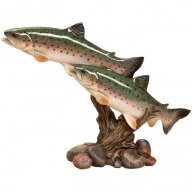 It is recommended that you use a heavier weight line than you use for other types of fish. Use at least a 10 pound test. The most common bait for catfishing includes nightcrawlers, chicken liver, grasshoppers, minnows, cut bait, stink bait, cheese, hot dogs, and even bubble gum! Use a sponge hook when fishing with dip or stink bait. Photo by Ryan Somma on Flickr. Photo by Cliff1066 on Flickr.